Want a gift certificate for that special someone? Is that special someone you? Would you like a studio credit toward product from a past session? Good news! We now have Gift Certificates Available here on the website! Simply choose your amount and you will be directed towards a page to enter a personalized note. 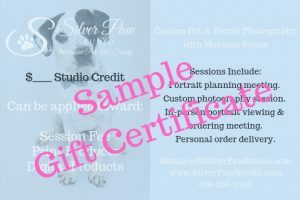 From there I will email you the custom gift certificate you can email or print.